Thanks to everyone for reading. And Happy 2010 to All! The first week of 2010 will be chock-full of data. Should be very interesting. And oh ... good riddance to the aughts! Prices are still too high in some areas ... yeah, these people put half a million down - and the foreclosure auction is coming up. "I've been at this 35 years, and it's by far the worst I've seen it," says Jeff Cronrod of the American Apartment Owners Association. Nationwide, apartment vacancy is 7.8%, up from 4.8% at the end of 2007, says MPF Vice President Greg Willett. Note: Reis reported the apartment vacancy rate at a 23 year high 7.8% at the end of Q3 2009, and the Census Bureau reported the total rental vacancy rate at a record 11.1%. The article notes that the supply of rental units is growing as investors buy homes to rent for cash flow and some "homeowners who want to move but can't sell their houses because they're worth less than their mortgages are renting them out instead." Here are the results of the reader poll. Thanks to the 4,518 people who participated! The first question was the outlook for GDP growth in 2010. 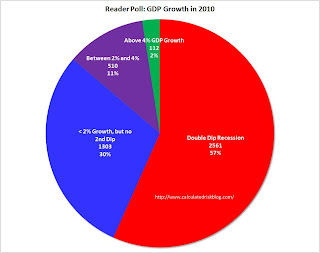 Readers who participated in the poll tend to be pessimistic, with 57% expecting a double dip recession, and another 30% expecting real GDP growth to be below 2% in 2010. Usually the economy grows very quickly after a severe recession. As an example, following the '48/'49 recession, the economy grew at a double digit growth rate for the first three quarters of the recovery. In the 2nd half of 1959, the economy grew at a 9.7% rate, and in the year following the '73/'75 recession, GDP increased 6.2%. Since this was the most severe recession since the Great Depression, a normal recovery would probably be 8%+ real GDP growth for a year or so. That isn't going to happen. Even a 4% growth rate would have to be considered sluggish by historical standards. I'll post more on the reasons for my outlook, but I think the U.S. will avoid a double dip recession, and 2010 GDP growth will be in the 2% to 3% range. 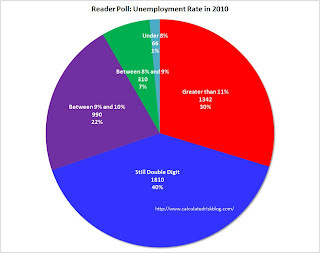 The second question concerned the unemployment rate at the end of 2010 (December 2010). Most poll participants (70%) are expecting the unemployment rate to be at or above 10% at the end of 2010. I think it might be close, but I agree with the majority on the unemployment rate (still double digits in Dec 2010). There will be a temporary positive impact from the 2010 Census, and I expect another stimulus package (labeled a "jobs package") to be announced in the next few months - and maybe that will push the rate down below double digits. I'll have more in the next few days. Thanks again for participating! I hope most of us are too pessimistic. In terms of the occupancy rate, 2009 was the worst year since the Great Depression (close to 55%). And last week was no exception with Smith Travel Research reporting the occupancy rate fell to 33.8 percent - the lowest weekly occupancy rate on record. In year-over-year measurements, the industry’s occupancy fell 5.4 percent to end the week at 33.8 percent. Average daily rate dropped 8.0 percent to finish the week at US$85.78. Revenue per available room for the week decreased 13.0 percent to finish at US$29.02. This graph shows the occupancy rate by week for each of the last four years (2006 through 2009 labeled by start of month). Note: Some of the holidays don't line up - especially at the end of the year. The end of the year can be a little confusing because of the holidays, and the next key weeks will be mid-to-late January to see if business travel is picking up in 2010. Note: Any reading below 100 shows contraction for this index. The index is a year-over-year index, so the headline index might be slow to recognize a pickup in business, but the underlying details suggests ongoing weakness. [T]he National Restaurant Association’s ... 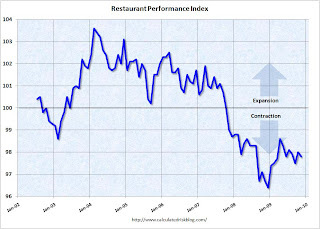 Restaurant Performance Index (RPI) ... stood at 97.8 in November, down 0.2 percent from its October level. In addition, the RPI remained below 100 for the 25th consecutive month, which signifies contraction in the index of key industry indicators. The Current Situation Index, which measures current trends in four industry indicators (same-store sales, traffic, labor and capital expenditures), stood at 96.0 in November – down 0.5 percent from October and tied for its second-lowest level on record. In addition, November represented the 27th consecutive month below 100, which signifies contraction in the current situation indicators. Along with soft sales and traffic levels, operators reported a dropoff in capital spending activity. Thirty-three percent of operators said they made a capital expenditure for equipment, expansion or remodeling during the last three months, down from 40 percent who reported similarly last month. Note: For fun, see the reader polls on the right sidebar for 2010 economic outlook. Polling ends today at 3 PM ET. In the week ending Dec. 26, the advance figure for seasonally adjusted initial claims was 432,000, a decrease of 22,000 from the previous week's revised figure of 454,000. The 4-week moving average was 460,250, a decrease of 5,500 from the previous week's revised average of 465,750. The advance number for seasonally adjusted insured unemployment during the week ending Dec. 19 was 4,981,000, a decrease of 57,000 from the preceding week's revised level of 5,038,000. This graph shows the 4-week moving average of weekly claims since 1971. The four-week average of weekly unemployment claims decreased this week by 5,500 to 460,250. This is the lowest level since September 2008. 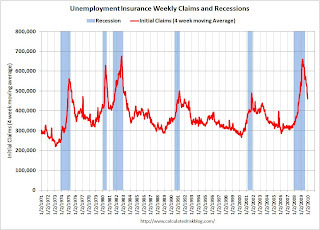 The decline in initial claims is good news, although the 4-week average suggests continuing job losses. Also we have also to be careful because data can be volatile during the holidays. ... For the first time in history, [New York]’s main bank account is poised to end the year in the red. ... New York had a negative balance of $174 million in its general fund on Wednesday, with nearly $1 billion in bills owed by day’s end. ... To fill the gap, New York will be forced to rely on ... raiding its short-term investment pool ... But that account itself is dangerously low, with only about $800 million on hand, compared with a balance in more flush years of as much as $16 billion. And the lower the short-term balance falls, the harder it is for the state to cover its day-to-day bills and the closer New York moves toward a previously unimaginable eventuality: A government check that bounces. No problem - just write IOUs. This is a pretty bold squatter. According to Jim, the squatter moved in right after the tenant left ... and when the landlord (in foreclosure) showed up, the squatter called the cops and accused him of trying to break in - and apparently was able to obtain a restraining order against the owner ... it is now Jim's problem! Treasury will commit $3.8 billion of new capital to GMAC ... Prior to today's actions, Treasury had invested $12.5 billion in preferred stock of GMAC. Treasury owns $13.1 billion in preferred stock in GMAC, through purchases and the exercise of warrants, and 35 percent of the common equity in GMAC. The Treasury Department said it will increase its stake in GMAC to 56 percent from 35 percent. It also will hold about $14 billion in what amount to loans that GMAC may eventually be required to repay. I've added two polls on the right sidebar. Predict the 2010 GDP growth and the Dec 2010 unemployment rate. I'll post the poll results here tomorrow and post my own thoughts over the weekend. Please feel free to post your predictions in the comments too - and I'll link to this post next year. Here is a comparison of real house prices and the unemployment rate using the LoanPerformance national house price data (starts in 1976) and Case-Shiller Composite 10 index (starts in 1987). Both indexes are adjusted by CPI less shelter. This is an update to a post earlier this year. The two previous national declines in real house prices are evident on the graph (early '80s and early '90s). The dashed green lines are drawn at the peak of the unemployment rate following the peak in house prices. In the early '80s, real house prices declined until the unemployment rate peaked, and then increased sluggishly for a few years. Following the late 1980s housing bubble, real house prices declined for several years after the unemployment rate peaked. 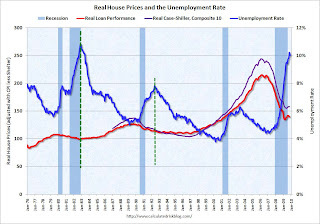 Although there are periods when there is no relationship between the unemployment rate and house prices, this graph suggests that house prices will not bottom (in real terms) until the unemployment rate peaks (or later, especially since the current bubble dwarfs those previous housing bubbles). This also suggests that real house prices are probably 10% or more too high on a national basis. Readings above 50% indicate expansion, and below 50% indicate contraction, so this suggests business activity is increasing. This index is for both manufacturing and service activity in the Chicago region. In general the Chicago area is considered representative of the mix of manufacturing and non-manufacturing business activity in the nation. The national ISM manufacturing index will be released Monday, and the ISM non-manufacturing index next Wednesday. The Democratic Party of Japan said that the scheme would deliver annual real GDP growth of at least 2 per cent between now and 2020 and ... is thought to be an attempt by the Government to quash rising domestic fears over the country’s gargantuan mound of public debt. The debt equates to about 180 per cent of GDP and will probably hit 200 per cent in the wake of the record budget announced last week. Halfway through the Government’s ten-year plan, Japan's debt relative to GDP may rise to 246 per cent, according to analysts from the International Monetary Fund. Since its property bubble burst 20 years ago, Japan has borrowed heavily to stimulate the economy and recent years have seen the level of debt spiral wildly. Talk about a high level of debt to GDP. There has been much more on the Dec 24th press release from Treasury. From Tim Duy: Why Christmas Eve? It’s in the law: the Treasury’s authorization in [Housing and Economic Recovery Act (HERA) of 2008] to alter the terms, conditions and amounts under any agreements (such as the PSPAs) to purchase Fannie or Freddie obligations expires December 31, 2009. After that date, new authorization would be required from Congress. That explains the timing. My guess is some people at Treasury aren't working this week, so last Thursday was the deadline. Too much is at stake, for taxpaying homeowners, to leave outstanding even a small “tail risk” that one of the enterprises would penetrate the cap. We’ve all seen how politics - even the agendas of a small minority - can stall lawmaking by the majority. Read the law (HERA): if a deficiency goes unfunded, the deficient enterprise goes into receivership. And receivership (as opposed to the current conservatorship) means the enterprise would be wound down. So Ms. Lowell suggests this was probably to avoid a low probability event that could have triggered a huge political battle - and put the housing market at further risk since the housing market is currently "overwhelmingly supported by FHA/Ginnie Mae, Fannie and Freddie". A Treasury representative said the bailout caps were suspended "specifically to ensure continued confidence in Fannie Mae and Freddie Mac, but were not based on any considerations" related to an expansion of the administration's loan-modification program. I guess this qualifies as a huge nothingburger. The Treasury Department plans to announce as early Wednesday afternoon that it will give GMAC Inc. around $3.5 billion in additional capital, sources told The Detroit News. ... The Treasury Department said earlier this year it would invest up to $5.6 billion more in GMAC -- on top of $13.4 billion GMAC has received over the last year. Most of the losses have come from ResCap, GMAC's mortgage unit. Just a few billion more. Nothing compared to AIG, Freddie and Fannie. First, from Brett Arends in the WSJ on May 6, 2008: Is Housing Slump at a Bottom? Wellesley College Prof. Karl E. Case, one of the leading experts on the housing market in the country ... suggests we may be at, or near, the bottom of the housing crash. "It is really remarkable how much where we are today looks like the bottom we've had in the last three cycles," Mr. Case says. "Every time we've gone below a million starts, the market has cleared at that moment." "It's bottom-fishing time, I think," says Mr. Case. "There's got to be bargains in Florida, Arizona and Nevada." Total starts were at 574 thousand in November after falling to a low of 479 thousand earlier this year - half the number of starts from when Prof. Case called the bottom in 2008. And on "bottom-fishing" in Florida, Arizona and Nevada: prices have fallen 23.5%, 31,3% and 36.4% in Miami, Phoenix and Las Vegas respectively since Prof. Case's suggestion in May 2008 using his own Case-Shiller index. He then provides a chart that shows this is the lowest level since the early '70s for this metric. Mr. Arends does add many cautions and caveats. House prices are not cheap nationally. This is apparent in the price-to-income, price-to-rent, and also using real prices. Sure, most of the price correction is behind us and it is getting safer to be a bottom caller! But "cheap" means below normal, and I believe that is incorrect. The following graph shows the price-to-income ratio using the Case-Shiller national index as of Q3 2009, and the Census Bureau's median income tables (assuming no increase for 2009). Using national median income and house prices provides a gross overview of price-to-income (it would be better to do this analysis on a local area). 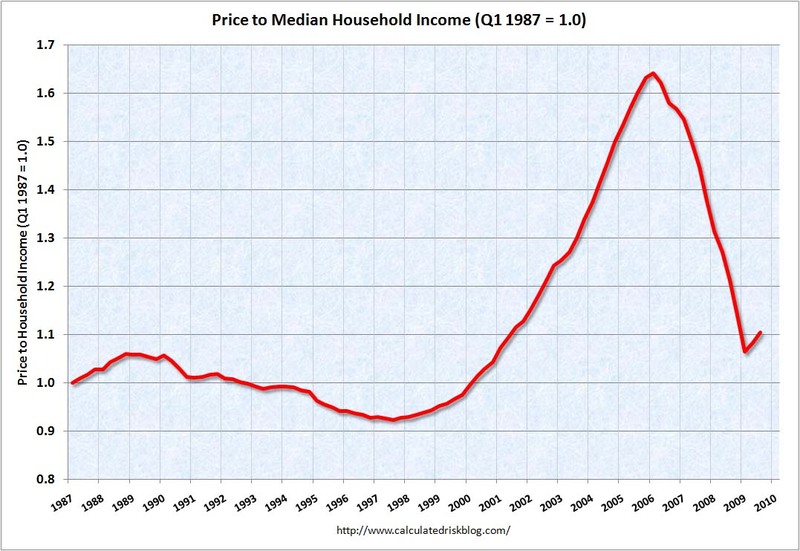 However this does shows that the price-to-income is still too high, and that this ratio needs to fall another 10% or so. A further decline in this ratio could be a combination of falling house prices and/or rising nominal incomes. The second graph shows the price to rent ratio (January 2000 = 1.0) for the Case-Shiller composite indices through October. For rents, the national Owners' Equivalent Rent from the BLS is used. Although most of the adjustment in the price-to-rent ratio is behind us, it appears this ratio is still a little high. As Mr. Arends also noted, this is national data, so beware of the local variations. So why does Mr. Arends think "homes are now cheap"? Because he is using a measure of affordability based on mortgage interest rates. This is a mistake without further anlaysis. Imagine this simplified example with a buyer willing to pay $1000 per month. With a 5% mortgage rate, the buyer could afford a $186,282 30 year fixed rate mortgage (principal and interest). But the buyer expects to sell the home in seven years, and he expects mortgage rates to be 7% then. That means the new buyer - who will also be willing to pay $1000 per month - can only afford a mortgage of $150,308. So how does the affordability index account for this expected $36,000 loss? It doesn't. It ends up in this simplified example, the current buyer would be willing to pay about $161,000 today because of the lower interest rate if he was planning on selling in seven years at $150,000 - excluding all expenses, transaction costs, tax savings, discount rates, etc. The actual calculation would be extremely complicated. [I]nterest rates are low right now. ... you can get a 30-year fixed-rate mortgage under 6%. If the economy recovers that won't last. If you are shopping for a home, it is probably worth seeing if you can lock in one of these rates cheaply. But the real key is to focus on supply and demand, and on the general fundamentals of price-to-income and price-to-rent (not perfect measures). House prices are not currently "cheap". They just aren't outrageously expensive nationally anymore. Click on graph for slightly larger image in new window. The American Trucking Associations’ advance seasonally adjusted (SA) For-Hire Truck Tonnage Index increased 2.7 percent in November, following a 0.2 percent contraction in October. The latest gain boosted the SA index from 103.6 (2000=100) in October to 106.4, its highest level in a year. 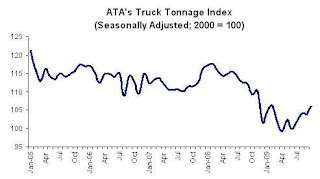 The not seasonally adjusted index, which represents the change in tonnage actually hauled by the fleets before any seasonal adjustment, equaled 100.8 in November, down 8.0 percent from October. Compared with November 2008, SA tonnage fell 3.5 percent, which was the best year-over-year showing in twelve months. In October, the index was down 5.2 percent from a year earlier. Trucking serves as a barometer of the U.S. economy, representing nearly 69 percent of tonnage carried by all modes of domestic freight transportation, including manufactured and retail goods. The economy fell off a cliff in September 2008, so the year-over-year comparisons are getting easier. As ATA Chief Economist Bob Costello noted, trucking benefited from the inventory correct, and he believes that is nearing completion - and trucking will likely "exhibit starts and stops" until there is a pickup in domestic end demand. Note: I think this is the highest level since January, unless January was revised down. Deposits at all banks will still be insured up to $250,000 through 2013 under the FDIC's general deposit insurance rules, so the vast majority of consumers don't need to worry. But starting Friday, checking account balances that exceed $250,000 will no longer be covered under the FDIC's Transaction Account Guarantee Program at some banks. Although few individuals keep more than $250,000 in a checking account, many businesses and nonprofits do to handle payroll, accounts receivable and other cash-flow needs. Even a small business might occasionally have a balance exceeding $250,000 when a large payment comes in or a big bill is coming due. The FDIC's Transaction Account Guarantee Program will continue (insuring non-interest-bearing transactional accounts above $250,000), but the FDIC raised the fees and many banks have opted-out. The program was supposed to expire at the end of this year, but in August the FDIC announced it would continue through June 30. However, starting Friday the fee will jump to 15, 20 or 25 cents per $100 in insured deposits, depending on the bank's risk category. Banks had until Nov. 2 to tell the FDIC if they would opt out of the program at the end of this year. The FDIC could not say how many banks did, but many large ones - including Citibank, Bank of America, Chase and Wells Fargo - have disclosed they are dropping out. 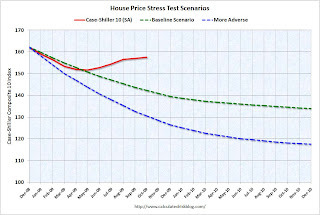 This following graph compares the Case-Shiller Composite 10 SA index with the Stress Test scenarios from the Treasury (stress test data is estimated from quarterly forecasts). House prices are 10.7% higher than the baseline scenario, and 20.6% higher than the more adverse scenario. There were three key economic stress test parameters: house prices, GDP and unemployment. Both house prices and GDP are performing better than the baseline scenario, and unemployment is performing worse than both stress test scenarios. 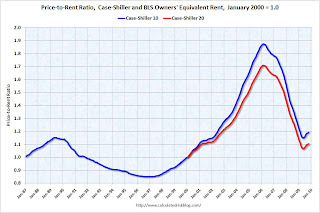 This graph shows the price to rent ratio (January 2000 = 1.0) for the Case-Shiller composite indices. For rents, the national Owners' Equivalent Rent from the BLS is used. At the peak of the housing bubble it was obvious that prices were out of line with fundamentals such as price-to-rent, price-to-income and real prices. Now most of the adjustment in the price-to-rent ratio is behind us. It appears the ratio is still a little high, and the recent increase was a combination of falling rents and rising house prices (probably due to the massive government intervention). 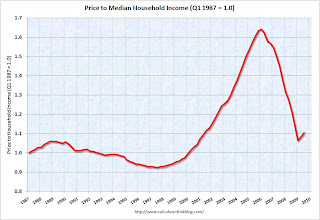 I expect some further decline in prices, although it isn't as obvious as in 2005. And finally, here is a graph of the LoanPerformance index (with and without foreclosures) and the Case-Shiller Composite 20 index. Earlier LoanPerformance announced that house prices fell 0.7% in October. This graph shows the three indices with January 2000 = 100. The indices mostly move together over time. Notice how the total LoanPerformance index fell further than the index excluding foreclosures - and also rebounded more. The seasonally adjusted Case-Shiller index increased slightly in October and the LoanPerformance index showed a decline. 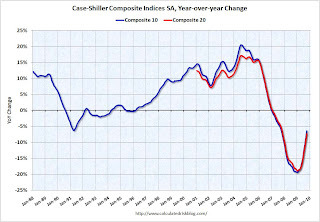 However Case-Shiller is an average of three months, so there might be a decline next month. 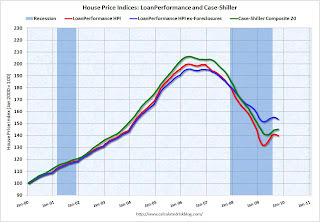 S&P/Case-Shiller released their monthly Home Price Indices for October this morning. This monthly data includes prices for 20 individual cities, and two composite indices (10 cities and 20 cities). This is the Seasonally Adjusted data - some sites report the NSA data. The first graph shows the nominal seasonally adjusted Composite 10 and Composite 20 indices (the Composite 20 was started in January 2000). The Composite 10 index is off 30.5% from the peak, and up about 0.4% in October. The Composite 20 index is off 29.5% from the peak, and up 0.4% in October. NOTE: S&P reported this as "flat", but they were using the NSA data. The second graph shows the Year over year change in both indices. The Composite 10 is off 6.4% from October 2008. The Composite 20 is off 7.3% from October 2008. This is still a significant YoY decline in prices. The third graph shows the price declines from the peak for each city included in S&P/Case-Shiller indices. Prices decreased (SA) in 9 of the 20 Case-Shiller cities in October. In Las Vegas, house prices have declined 56.3% from the peak. At the other end of the spectrum, prices in Dallas are only off about 5.4% from the peak - and up slightly in 2009. 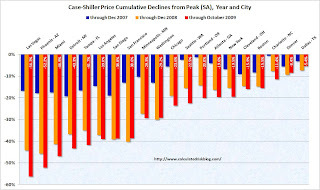 Prices have declined by double digits from the peak in 18 of the 20 Case-Shiller cities. “The turn-around in home prices seen in the Spring and Summer has faded with only seven of the 20 cities seeing month-to-month gains, although all 20 continue to show improvements on a year-over-year basis. All in all, this report should be described as flat.” says David M. Blitzer, Chairman of the Index Committee at Standard & Poor’s. As of October 2009, average home prices across the United States are at similar levels to where they were in the autumn of 2003. From the peak in the second quarter of 2006 through the trough in April 2009, the 10-City Composite is down 33.5% and the 20-City Composite is down 32.6%. With the relative improvement of the past few months, the peak-to-date figures through October 2009 are -29.8% and -29.0%, respectively. Prices declined in 12 of the 20 Case-Shiller cities, and were flat in New York. CRE: "We thought we were different"
In 2007, developers excavated a deep hole in downtown Seattle at Second Avenue and Pine Street for the foundation of a 23-story luxury hotel and condo tower. They filled the hole in 2009. That pretty much captures the kind of year it's been for commercial real estate in the Seattle area. "About a year and a half ago, we thought we were different," [Jim DeLisle, a University of Washington professor of real-estate studies] told one recent forum. "Nobody is really different." How times did we hear "it is different here" during the housing bust? 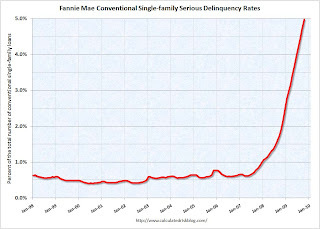 Fannie Mae reported today that the rate of serious delinquencies - at least 90 days behind - for conventional loans in its single-family guarantee business increased to 4.98% in October, up from 4.72% in September - and up from 1.89% in October 2008. "Includes seriously delinquent conventional single-family loans as a percent of the total number of conventional single-family loans. These rates are based on conventional single-family mortgage loans and exclude reverse mortgages and non-Fannie Mae mortgage securities held in our portfolio. A measure of credit performance and indicator of future defaults for the single-family ... credit books. We include single-family loans that are three months or more past due or in the foreclosure process ... We include conventional single-family loans that we own and that back Fannie Mae MBS in our single-family delinquency rate, including those with substantial credit enhancement." Just more evidence of the growing delinquency problem, although it is important to note these stats do include Home Affordable Modification Program (HAMP) loans in trial modifications (and the trial modification periods have been extended again). Last Thursday, Treasury issued an Update on Status of Support for Housing Programs. One of the key points was to increase the cap on Treasury's funding commitment "to accommodate any cumulative reduction in net worth over the next three years". Treasury will also amend the terms of its agreements with Fannie Mae and Freddie Mac to support their ongoing stability. The steps outlined today are necessary for preserving the continued strength and stability of the mortgage market. The amendments to these agreements announced today should leave no uncertainty about the Treasury's commitment to support these firms as they continue to play a vital role in the housing market during this current crisis. Why not just be explicit and explain the reasons for the change? The government may put a mortgage-modification effort, called the Home Affordable Modification Program, or HAMP, into overdrive in coming years, pushing for reductions in the principal outstanding on home loans overseen by Fannie and Freddie, Bose George, an analyst at Keefe, Bruyette & Woods, wrote in a note to investors Monday. [A] few folks postulated that the Treasury’s move to explicitly up the government’s potential support for Fannie and Freddie might be related to plans by the Treasury to expand the HAMP to include a principal reduction plan, which would accelerate losses on HAMP modifications. I have no clue what’s going on in the minds of Treasury officials, I very much doubt that any such change in the cards soon. Note: of course HAMP already allows principal reductions, but servicers receive no additional subsidy for principal reduction. Credit Suisse argued that this increases the prospect of "large-scale voluntary buyouts" of delinquent mortgages guaranteed by Fannie and Freddie. Other analysts have argued this could be related to the adoption of FAS 166/167 in January. And still another analyst suggested Fannie and Freddie would become the world’s biggest SIVs, and he viewed this as an attempt to hold down mortgage rates after the conclusion of the Fed's program to purchase MBS. Dean Baker wrote at the HuffPost: Fannie Mae and Freddie Mac: Just a Four-Letter Word? Since Fannie and Freddie went into conservatorship in September of 2008, it has been explicit policy that the government would back up their debt. Originally, $200 billion was committed for this purpose. That amount was subsequently doubled to $400 billion ... [T]he Obama administration should make its case to the public and explain how losses could conceivably run above $400 billion (credit markets don't need reassurance against inconceivable events). And that is really the bottom line: Why did Treasury release this on Christmas Eve with essentially no explanation. This has just lead to speculation and confusion. Why not be explicit? Why should we have to guess? 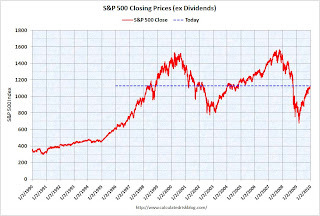 The first graph shows the S&P 500 since 1990. The dashed line is the closing price today. The S&P 500 was first at this level in April 1998; over 11 1/2 years ago. The S&P 500 is up 67% from the bottom (451 points), and still off 28% from the peak (438 points below the max). The second graph is from Doug Short of dshort.com (financial planner): "Four Bad Bears". Note that the Great Depression crash is based on the DOW; the three others are for the S&P 500. Fannie Mae has always had the option to repurchase seriously delinquent loans out of its MBS at par (100% of the unpaid principal balance) plus accrued interest to the payoff date. This returns principal to the investors, so they are made whole. If Fannie Mae can work with the servicer to cure these loans, they become performing loans in Fannie Mae’s portfolio. If they cannot be cured, they are foreclosed, and Fannie Mae shows the charge-off and foreclosure expense on its portfolio’s books (these are no longer on the MBS’s books, since the loan was bought out of the MBS pool). Now, Fannie also sometimes has the obligation to buy loans out of an MBS pool. But we are—Fannie Mae made this clear both in the footnote to Table 26 of the Q and in the conference call—talking about optional repurchases. Why would Fannie Mae buy nonperforming loans it doesn’t have to buy? Because it has agreed to workout efforts on these loans, including but not necessarily limited to pursuing a modification. Under Fannie Mae MBS rules, worked out loans have to be removed from the pools (and the MBS has to receive par for them, even if their market value is much less than that). El-Erian says people are fooling themselves if they think all the bullish data of late means a strong recovery is in the offing. So he's buying Treasurys and selling riskier stuff. His bet: Investors will get scared again and want U.S.-guaranteed debt so they know they'll get repaid. Earlier Greenlaw argued that the Fed would start raising rates in the 2nd half of 2010 because of rising inflation, even with a fairly weak economy. I think it is unlikely that the Fed will raise rates in 2010 (although possible) - and I'll definitely take the under on Greenlaw's 2010 prediction of 7.5%+ rates on 30-year fixed mortgages - that seems extremely unlikely. Talk about a low effective rent. Not only is the tenant getting two years free rent, but the tenant improvements are about 4 years of rent (the lease is triple net, so the tenant is also paying taxes, insurance and maintenance). And the tenant can cancel after 7 years ... the landlord is mostly just covering expenses. To review - at the end of Q3, Reis reported the national office vacancy rate rose to 16.5% in Q3 from 15.9% in Q2. We should have the Q4 numbers in early January. 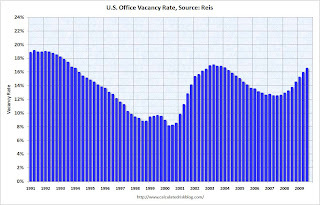 This graph shows the office vacancy rate starting 1991. The peak following the previous recession was 17%. I've also heard there has been a sharp increase in occupied available space (tenants planning to downsize), suggesting the vacancy rate could increase significatly in 2010. New York State’s courts are closing the year with 4.7 million cases — the highest tally ever — and new statistics suggest that courtrooms are now seeing the delayed result of the country’s economic collapse. New York’s judges are wading into these types of cases by the tens of thousands, according to the new statistics, cases involving not only bad debts and soured deals, but also filings that are indirect but still jarring measures of economic stresses, like charges of violence in families torn apart by lost jobs and homes in jeopardy. And this is apparently happening all across the country. 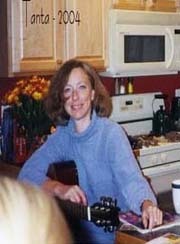 [T]he broad impact of the recession is clear in hundreds of thousands of new cases across the judicial system, including people challenging their real estate taxes, home foreclosures, contract disputes and family offenses. I've been tracking the surge in personal bankruptcy filings, and an increase in business disputes always happens during a recession, but what is really is sad is all the family disputes. As everyone knows there has been a massive government effort to support house prices. Some of this has been aimed at limiting supply (modification programs, various foreclosure moratoria), and some has been aimed at increasing demand (tax credit, lower mortgage rates, loose lending standards). "We were very careful from the beginning ... to say that we are going to focus the bulk of the financial force on bringing interest rates and mortgage rates down to cushion the fall in housing prices and help stabilize home values, which will feed into people's basic sense of financial stability." Proponents of the $8,000 credit for first-time buyers and the $6,500 credit for move-up buyers made it clear during the debate on Capitol Hill that the benefits would not be renewed when they expire. And a lobbyist for the National Assn. of Realtors confirmed that at the group's annual convention last month. Lawmakers "made us promise practically in blood that we would not come back" for another extension, Linda Goold, the Realtor group's director of tax policy, told her members. During the debate, Sen. Johnny Isakson (R-Ga.), a former real estate broker and a longtime proponent of the tax credit, promised his colleagues, "This is the last extension." [T]he Federal Reserve is in the process of purchasing $1.25 trillion of agency mortgage-backed securities and about $175 billion of agency debt. In order to promote a smooth transition in markets, the Committee is gradually slowing the pace of these purchases, and it anticipates that these transactions will be executed by the end of the first quarter of 2010. The program that Treasury established under HERA to support the mortgage market by purchasing Government-Sponsored Enterprise (GSE) -guaranteed mortgage-backed securities (MBS) will end on December 31, 2009. By the conclusion of its MBS purchase program, Treasury anticipates that it will have purchased approximately $220 billion of securities across a range of maturities. In order to provide servicers an opportunity to remain focused on converting eligible borrowers to permanent HAMP modifications, effective today and lasting through January 31, 2010, Treasury is implementing a review period for all active HAMP trial modifications scheduled to expire on or before January 31, 2010. Active HAMP trial modifications include trial modifications that have been submitted to the Treasury system of record that have not been cancelled by the servicer. During this review period, servicers should continue to convert eligible borrowers in active HAMP trial modifications to permanent HAMP modifications as quickly as possible in accordance with existing program guidance. Servicers may not cancel an active HAMP trial modification during this period for any reason other than failure to meet the HAMP property eligibility requirements. Treasury is now amending the [Preferred Stock Purchase Agreements (PSPAs)] to allow the cap on Treasury's funding commitment under these agreements to increase as necessary to accommodate any cumulative reduction in net worth over the next three years. At the conclusion of the three year period, the remaining commitment will then be fully available to be drawn per the terms of the agreements. Fannie / Freddie Low-Cost Refinancing program. This is the program that allows homeowners with Fannie and Freddie mortgages to refinance loans up to 125 percent LTV. I believe this program expires June 10, 2010. •Reduce the maximum seller concession from 6% to 3%. •Raise the minimum FICO score. •Increase the up-front cash for borrower (it isn't clear if this is an increase in the downpayment, currently a minimum of 3.5%, or requiring the borrower to pay more fees). Various Holiday Foreclosure Moratoria: Fannie, Freddie and most of the large banks routinely suspend foreclosure activity over the holidays. This has been true this year too. Fannie and Freddie's holiday moratoria ends Jan 3, 2010, and Citi's holiday moratoria ends Jan 17th. The other banks programs end in early January too. The key economic report this holiday week is the Case-Shiller house price index for October that will be released on Tuesday. The Case-Shiller index is actually an average for 3 months and the concensus is for further gains, although the house price index from LoanPerformance showed a decline in October. In other economic news, the Chicago PMI will be released on Wednesday. Other recent regional indicators - the New York Fed's Empire State Manufacturing Survey and Richmond Fed’s Survey of Manufacturing Activity - have suggested a slowing in the manufacturing sector. The monthly trucking and restaurant surveys will also be released this week. Existing-home sales – including single-family, townhomes, condominiums and co-ops – rose 7.4 percent to a seasonally adjusted annual rate of 6.54 million units in November from 6.09 million in October, and are 44.1 percent higher than the 4.54 million-unit pace in November 2008. Sales in Nov 2009 (6.54 million SAAR) were 7.4% higher than last month, and were 44% higher than Nov 2008 (4.54 million SAAR). 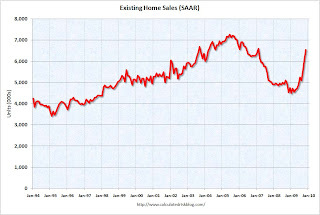 Here is more on existing home sales. The Census Bureau reports New Home Sales in November were at a seasonally adjusted annual rate (SAAR) of 355 thousand. This is a sharp decrease from the revised rate of 400 thousand in October (revised down from 430 thousand). 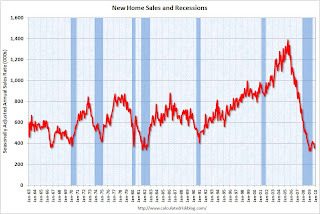 The second graph shows New Home Sales vs. recessions for the last 45 years. New Home sales fell off a cliff, but after increasing slightly, are now only 8% above the low in January. Sales of new one-family houses in November 2009 were at a seasonally adjusted annual rate of 355,000 ... This is 11.3 percent (±11.0%) below the revised October rate of 400,000 and is 9.0 percent (±15.3%)* below the November 2008 estimate of 390,000. See this post for more on New Home sales. 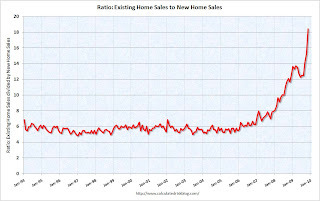 The following graph shows the ratio of existing home sales divided by new home sales through November. This ratio has increased again to a new all time high. The ratio of existing to new home sales increased at first because of the flood of distressed sales. This kept existing home sales elevated, and depressed new home sales since builders couldn't compete with the low prices of all the foreclosed properties. The recent increase in the ratio was partially due to the timing of the first time homebuyer tax credit (before the extension) - and partially because the tax credit spurred existing home sales more than new home sales. CRE prices only go back to December 2000. 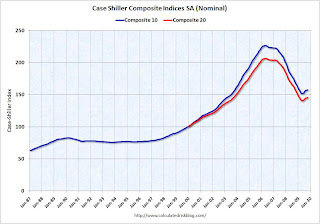 The Case-Shiller Composite 20 residential index is in blue (with Dec 2000 set to 1.0 to line up the indexes). 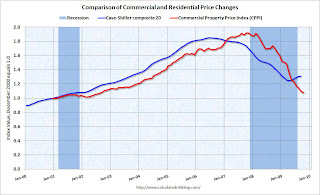 CRE prices peaked in late 2007 and have fallen 44% from the peak and are now back to September 2002 levels. Servicers can’t cancel an active Home Affordable trial modification scheduled to expire before Jan. 31 for any reason other than property eligibility requirements, according to a posting today on a government Web site. The Treasury said it would provide capital as needed to Fannie Mae and Freddie Mac over the next three years, in a move aimed at soothing investors' concerns about the government's continued support of the mortgage giants. The Financial Times quotes Chinese Premier Wen Jiabao as saying: ”We will not yield to any pressure of any form forcing us to appreciate. ... The purpose [of these calls for appreciation] is to hold back China’s development." In recent weeks the demands for China to appreciate its currency in order to help a rebalancing of the global economy have increased to include not only the US and the European Union but also developing nations such as Brazil and Russia. This is one of the key global imbalances and it looks like China will still not allow their currency to appreciate. Jim the Realtor: "Flippers Galore"
I noted that GDP growth in Q3 and Q4 weren't in question because of a transitory boost from changes in private inventories and from stimulus spending. 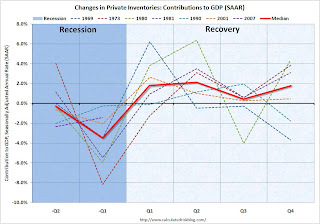 Here is a repeat of the graph showing the contributions to GDP from changes in private inventories for the last several recessions. The blue shaded area is the last two quarters of each recession, and the light area is the first four quarters of each recovery. The Red line is the median of the last 5 recessions - and indicates about a 2% contribution to GDP from changes in inventories, for each of the first two quarters coming out of a recession. The key is this boost is transitory. Last quarter I thought a 1% to 2% contribution from changes in inventories was possible. The actual contribution was 0.69%. I suspect that changes in inventories will add more to Q4; probably closer to 2%. I also thought Personal Consumption Expenditures (PCE) would be fairly strong in Q3, especially because of the cash-for-clunkers program. My guess was "3% PCE growth in Q3, and that would mean a contribution to GDP of about 2%." The final numbers were 2.8% and a contribution of 1.96%. 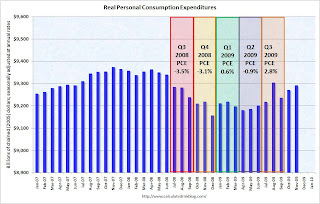 The following graph shows real Personal Consumption Expenditures (PCE) through November 2009 (in 2005 dollars). Note that the y-axis doesn't start at zero to better show the change. The quarterly change in PCE is based on the change from the average in one quarter, compared to the average of the preceding quarter. The colored rectangles show the quarters, and the blue bars are the real monthly PCE. Using the "two-month method" for estimating Q4 PCE growth gives an estimate of just under 1%. However - note that PCE in August was distorted by the cash-for-clunkers program (and that impacts the two-month method). So my guess is PCE growth in Q4 will be around 1.7% or a contribution to GDP of 1.2% or so. (less than the growth in Q3). As I've noted, residential investment has been moving sideways, although that will show up more in Q1 2010 than in Q4. So we can add in a positive contributions from net exports, some increase in residential investment (although smaller than in Q3), an increase in equipment and software investment - and subtract out investment in non-residential structures - and Q4 should look pretty healthy. "At a time of the year when ho-ho-ho is the catchword, the first six months of the US economic recovery look distinctly ho-hum following the latest reports. ... Although we continue to estimate a 4% growth rate for the fourth quarter, with upside risk to that figure, the composition of this growth is not strong. 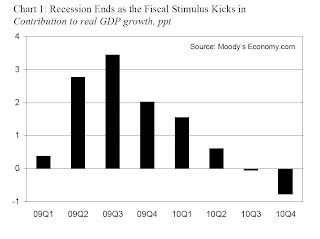 Almost half of it comes from a sharp slowing in the rate at which inventories are being drawn down ..."
And it is probably a good time to repeat this graph from economy.com's Mark Zandi suggesting the greatest impact from the stimulus package is now behind us. This suggests that all of the growth in Q3 was due to the stimulus package (and then some), and the impact is now waning - only 2% in Q4, and 1.5% in Q1 2010 - and then the impact on GDP growth will be negative in the 2nd half of 2010. Most of the increase from changes in private inventories will be behind us - although it could slip into Q1 2010, but without a pickup in end demand, the boost will end soon. Because of the huge overhang of vacant housing units, I expect any increase from residential investment to be muted. I expect the personal saving rate to increase over the next year - leading to slow PCE growth. Non-residential investment in structures will be a drag throughout 2010. And as I noted last quarter, on the plus side, exports might continue to provide a boost. So I still think GDP growth will be sluggish in 2010, with downside risks. Note: There are several upside and downside risks to this view. It is possible that the Treasury directive on Wednesday to extend the review period for all active HAMP trial modifications until at least Jan 31, 2010, and the announcement on Thursday to uncap the potential losses for Fannie and Freddie are somewhat related. There is a possibility that the Treasury is planning on introducing a principal reduction component to HAMP in January, and this could lead to significantly larger losses for Fannie and Freddie (just speculation on my part). There has been no announcement yet, and even if this is proposed it might only apply to Fannie and Freddie related loans, and not private MBS (the number of Fannie/Freddie loans compared to private MBS varies significantly by servicer). [A] problem with Part 2 is that this lowers the interest rate for borrowers far underwater, but other than the $1,000 per year principal reduction and normal amortization, there is no reduction in the principal. This probably leaves the homeowner far underwater (owing more than their home is worth). When these homeowners eventually try to sell, they will probably still face foreclosure - prolonging the housing slump. These are really not homeowners, they are debtowners / renters. Of course Treasury initially oversold the HAMP program claiming the initiative would "reach up to 3 to 4 million at-risk homeowners". Now they are defining "reach" as being "offered to". The key problem for the Treasury is they are concerned house prices will become unglued again if another flood of foreclosures hit the market. And this in turn could lead to further losses for the banks. [T]he average rate on a 30-year, fixed-rate mortgage rose to 5.05 percent this week and could climb to 6 percent by the end of 2010, if not sooner, according to giant mortgage financier Freddie Mac. The key catalyst for interest rates going forward will be the end of a Federal Reserve program that buys a sizable chunk of mortgage-backed securities issued by firms such as Fannie Mae and Freddie Mac. ... the Fed has committed to winding down the program by March. "If you told me by the end of 2010 a 30-year rate was at 6 percent, that sounds about right," says Mark Zandi, chief economist at Moody's. "I don't think there's any question rates are headed up." Rates are definitely moving up, and they will move higher as the Fed winds down the MBS purchase program. Although 6% is possible, I'll take the under in 2010. The reason is I think the recovery will be sluggish and choppy - and that will keep rates down. Note: Some people think 30 year mortgage rates will increase 100 bps or even 200 bps when the Fed stops buying MBS - so they expect 6% to 7% mortgage rates by April - but I think that estimate is too high. “What the average citizen doesn’t explicitly understand is that a significant part of the government’s plan to repair the financial system and the economy is to pay savers nothing and allow damaged financial institutions to earn a nice, guaranteed spread,” said [Bill Gross of PIMCO] ... Mr. Gross said he read his monthly portfolio statement twice because he could not believe that the line “Yield on cash” was 0.01 percent. At that rate, he said, it would take him 6,932 years to double his money. That is what my statement says too - not exactly the best return. But in less than 7,000 years the money will double! This is an unofficial list of Problem Banks compiled only from public sources. Last week’s closures had a large impact on the Unofficial Problem Bank List. Seven institutions with $14.5 billion in assets were removed from last week’s list because of failure. The failures included First Federal Bank of California ($6.1 billion), Imperial Capital Bank ($4.1 billion), Peoples First Community Bank ($1.8 billion), New South Federal Savings Bank ($1.5 billion), Independent Bankers' Bank ($584 million), and Rockbridge Commercial Bank ($294 million). Other removals include Manatee River Community Bank ($152 million), which merged with First America Bank, Osprey, FL; and Golden First Bank ($25 million), as the OTS terminated its formal action. Regulators did deliver some not so good Christmas gifts this week as formal actions were issued to three institutions including Midwest Bank and Trust Company, Elmwood Park, IL ($3.5 billion); Centrue Bank, Streator, IL ($1.3 billion); and Bayside Savings Bank, Port Saint Joe, FL ($86 million). With these changes, the Unofficial Problem Bank List includes 545 institutions with aggregate assets of $295.6 billion. The list is compiled from regulator press releases or from public news sources (see Enforcement Action Type link for source). The FDIC data is released monthly with a delay, and the Fed and OTC data is more timely. The OCC data is a little lagged. Credit: surferdude808. See description below table for Class and Cert (and a link to FDIC ID system). For a full screen version of the table click here. The table is wide - use scroll bars to see all information! Cert: This is the certificate number assigned by the FDIC used to identify institutions and for the issuance of insurance certificates. Click on the number and the Institution Directory (ID) system "will provide the last demographic and financial data filed by the selected institution". With the new rules for Fannie and Fredde, maybe it should be "Is that a Pig? No, it's Fannie Mae!" Click on Pig for larger image in new window. From the Yosemite Association, a live web cam view of Half Dome in Yosemite. Happy Holidays to all! Peter Cetera (formerly of the band "Chicago") and his daughter Claire perform Blue Christmas in 2008 with Sasha. Sasha hasn't competed since the World Championships in March 2006, but she will be making a comeback at the U.S. Championships on Jan 21st (short) and Jan 23rd (long) in Spokane. In year-over-year measurements, the industry’s occupancy declined 0.5 percent to end the week at 42.6 percent. Average daily rate dropped 5.2 percent to finish the week at US$87.98. Revenue per available room for the week decreased 5.6 percent to finish the period at US$37.47. The 0.5-percent occupancy decrease was the best full-week performance of the year for that metric. The 5.2-percent ADR drop was the third best full-week performance of the year behind two consecutive weeks in January. The 5.6-percent fall in RevPAR was the best full-week performance of the year. A major snow storm on the East Coast and easier year-over-year comparisons helped buoy the numbers. 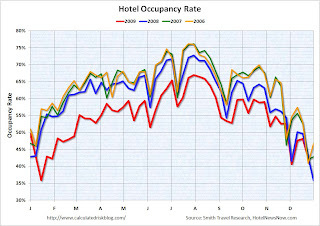 As I've been mentioning, there is now growing evidence that the hotel industry has stabilized at this low occupancy rate, although room rates will still be under pressure because this is the lowest occupancy rate (annual) since the Great Depression. The end of the year can be a little confusing because of the holidays, and the next key week will be mid-to-late January to see if business travel is picking up in 2010.